Australia. Employees and their immediate families of the agency conducting the draws (Engage Australia) are ineligible to enter. Employees of the Promoter directly involved in the Promotion and their immediate families are also ineligible to enter. Tasmanian home address listed on your F$C account, on the date on which the winners are drawn. 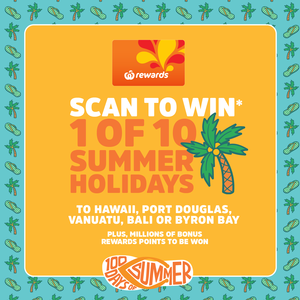 For the avoidance of doubt, holders of temporary Woolworths Rewards or temporary F$C cards are not eligible to enter or win prizes, as temporary Woolworths Rewards and temporary F$C cards are not Registered Cards. are up to date with their current, valid email address and phone number. the Promotional Period, subject to a limit of eight (8) entries per day. “Eligible BWS Shop” means a purchase of more than 1c in a single transaction in store at BWS (for Registered Cardholders of the Woolworths Rewards Program and of the Frequent Shopper Club Program) or at BWS Online (bws.com.au) (for Registered Cardholders of the Woolworths Rewards Program only), excluding any purchases of smoking products, gift cards (including iTunes), mobile recharge, Woolworths Mobile, travel cards, tickets, cash outs, delivery charges, donations and purchases on a charge account.